So I achieved a couple of things off the “move to Adelaide” list, though I still haven’t sorted the accommodation. I have about five properties to see, so hopefully one will be suitable and I get it. This line drawing means absolutely nothing other than I haven’t done one for a while and I felt like a change. In case you were wondering. Yes, still a day behind in the posting and leaving my drawing to the last minute. This is a continuously line drawing of Peppi snoozing (again, but it was late at night). He’s really shaggy but in there somewhere. I haven’t been to a life drawing class in ages so I have to grab a model when I find one. By this I naturally mean Pinterest…. 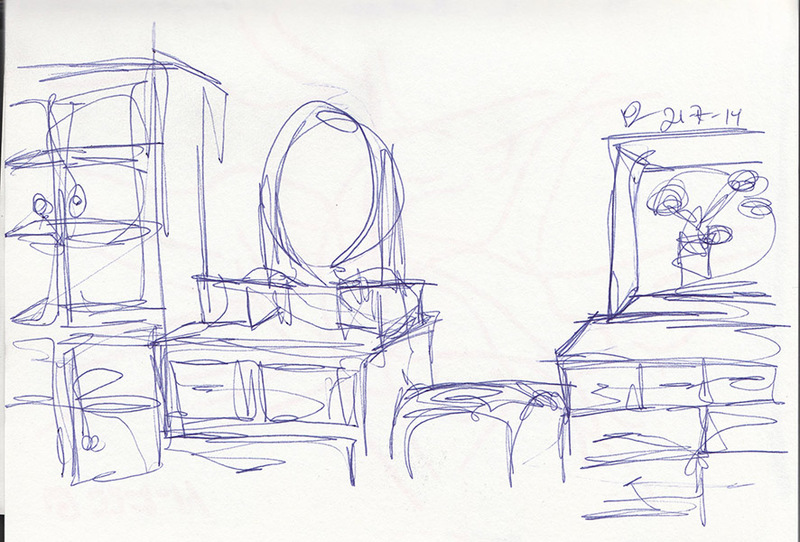 I say modernist, but what I really mean is laziness+inky pen brushes. The joys of a new sketchbook, nothing like breaking the ice with some still life. Pity I couldn’t find the energy to scan it in properly though, you’ll just have to image the full 3B line drawing glory. I thought about going to the NPG to sketch after work but this persistent dog bark and the lousy weather put me off, so it’s serious line drawings whilst watching rather serious movies on my not so serious laptop. Just a few objects from around the house, and from this morning’s kitchen clear out. I like line drawings, but I haven’t done a proper one for a while. This I first did in graphite and then went over in a scratchy pen. Fooled you! It’s really just a bit of tv sketching. But it is a drama series, and it was a profile, so not entirely a fabrication. I do like continuous line drawing for quick “poses”, much easier to capture the essence.